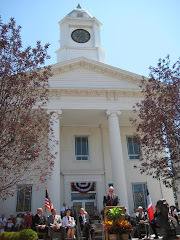 Hello and welcome to our Lafayette County (MO) Republican Blog! On this site you will be able to post your opinions regarding local, state, and national politics. You may also list upcoming events as well as news from other county central committees and Republican organizations such as Pachyderms, Republican Clubs, and Republican Federated Women's Clubs, to name just a few. At right is a photo of Gov. 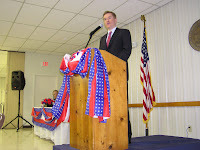 Matt Blunt speaking at our Lincoln Dinner last spring. Your opinions are important, and we want to hear from you; however, it is important to note that the blog will be constantly monitored with offensive or inappropriate posts removed immediately. This blog will not tolerate profanity or smears against any individual or group. You may state your views but do it objectively and politely, please. Another feature will be a poll question that will be changed often, especially as the 2008 campaign season nears. The white hawthorn blossom is the official state floral emblem of Missouri. Known as the "red haw" or "white haw," the hawthorn (crateagus) is a member of the great rose family, which resembles the apple group. The hawthorn blossoms have greenish-yellow centers and form in white clusters. More than 75 species of the hawthorn grow in Missouri, particularly in the Ozarks. The White Hawthorn Blossom was named the state flower of Missouri on March 16, 1923.